The job marketplace offered by pymetrics, headed by CEO Frida Polli, could boost agent retention rates. 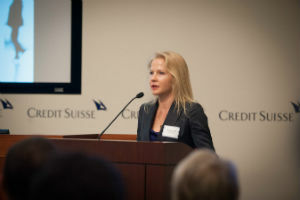 The job marketplace offered by pymetrics, headed by CEO Frida Polli (pictured here at FinTech), could boost agent retention rates. Life insurers, among other financial services companies, are not known for being on the leading of technology. In respect to consumer-oriented solutions —software that can ease and speed interactions with customers — the result has been a less-than-sterling track record. That’s evident, for example, in below average customer ratings of life insurers’ self-service web portals in comparison to those of other industries. Insurers can do much to close the technology gap, and thereby their bottom lines, by adopting cutting-edge solutions now coming to market. And not just those of established technology vendors; start-up companies are also rolling out solutions that promise to transform business processes. A half-dozen of these were on display at fourth annual FinTech Innovation Lab Demo Day in New York City on June 26. The Lab is a 12-week mentoring program created by Accenture and the Partnership Fund for New York City and is supported by more than a dozen of the world’s leading financial institutions to promote financial services technology (“fintech”) innovation and high tech job growth in New York City. Mobility, data analytics and credit risk solutions were among the six technology innovations demonstrated for top financial services, venture capital and technology executives at the gathering. Chief technology officers from 15 participating financial institutions chose the-start-up tech companies to exhibit at this year’s gathering. The companies included Enigma, Kasisto, LMRKTS, pymetrics, RevolutionCredit and Standard Treasury. The group has spent the last 12 weeks receiving high level mentoring, product and business development advice and exposure to senior financial industry, technology and venture capital executives. According to the Partnership Fund, the 18 previous alumni companies have raised more than $76 million in financing after participating in the program. One alumni company was recently acquired for $175 million. Enigma provides access to thousands of sources of public data on companies, people, and locations. The company gathers tens of billions of records from sources as diverse as SEC filings, government spending contracts, and asset-ownership records. The information is then indexed to support business decisions, such as underwriting, prospecting and trading. Financial institutions use Enigma as a supplement to proprietary databases to increase access to credit for small businesses, and assess real estate portfolio risk. Kasisto, a spin-off from SRI International (the creator of Siri), offers digital banking using a conversational user interface that lets consumers access financial information and perform complex transactions on their smartphones and tablets. The Kasisto Conversational AI Platform lets financial institutions integrate branded intelligent virtual personal assistants into their mobile applications. The IT platform can be used to enhance customer experience, reduce costs and boost user engagement on mobile channels. LMRKTS’ platform enables market participants to report, reconcile and reduce counterparty credit risk across asset classes. As a neutral third party, LMRKTS helps financial institutions net their existing derivatives exposures by applying algorithms that recommend changes in counterparty exposures when institutions are both long and short. This can help reduce counterparty risk and related capital charges for banks. LMRKTS’ platform can also be employed to minimize systemic risk. pymetrics is a next-generation job marketplace. Using neuroscience and big data, the company matches candidates to jobs and companies where (pymetrics claims) they’ll perform at the highest levels. pymetrics assesses the career aptitude and cognitive development of candidates using neuroscience games. The company creates proprietary, data-driven profiles from top employees’ performance on the games to find top-suited job candidates. Companies using pymetrics’ solution have enjoyed efficiency gains in recruiting and performance management. RevolutionCredit is a B2B credit data and decision-making platform that combines behavioral data and gamified financial education to benefit both consumers and financial institutions. Lenders, creditors, utilities, and subscription service providers partner with RevolutionCredit to assess consumer credit worthiness, improve customer acquisition and retention, and decrease loan losses. Through RevolutionCredit, creditors identify consumers who will perform one to two credit score bands better than their credit score would otherwise indicate. Standard Treasury builds, maintains, and supports white-labeled and co-branded developer platforms for banks worldwide. Standard Treasury says partner banks see material top-line growth through decreased costs to service their customers, decreased churn, and increased transaction volumes, while delivering value to their customers. Several of the IT solutions detailed above are be sure, bank-oriented. But others could potentially be integrated in modified form into life insurers’ technology platforms. Certainly this is true of the conversational user interface from Kasisto, which could empower insurers to offer mobile-enabled self-service capabilities not currently available. LMRKT’s platform, in particular its ability to minimize systemic risk, should provide an attractive feature to life insurers now labeled as SIFIs. And pymetrics’ job marketplace holds much promise for life insurers that have long suffered from high producer turnover and are looking to boost four-year agent retention rates. The technology solutions exhibited at FinTech could thus help to lift business prospects of a life insurance industry buffeted by rising consumer expectations, earnings-depressing market conditions (read: low interest rates) and potentially direct competition form the like of technology giants like Apple, Google and Amazon. Question is, are the life insurance companies up to the tech challenge?